Just as so many of us did through the 1980s, Scabies constructed his fandom from bits and pieces, with the whole remaining ever elusive. “No one had seen the Heartbreakers live, but we thought they looked great. We had seen pictures of Television, Richard Hell and Blondie but nobody had heard anything. Because Danny Fields was involved with the MC5 we knew [The Ramones] had to be the right kind of thing.” The right kind of thing, indeed. new version of Stealing — images wanted! 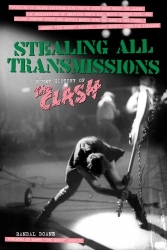 Happy Sunday — The announcement’s out for the much expanded version of Stealing All Transmissions: A Secret History of The Clash,* which has much more on the New York punk scene and on the London Calling LP. I still need your help with the images, though. I can’t afford Bob Gruen, alas, and I hope the #Clash nutters among you might have photos of the band, concert posters, etc., that you can send to me in digital format (jpg, if posibble) by 5/31. If your image is selected, I”ll send you a signed copy of the book upon its fall release. All correspondence to djaphasia [at] gmail cot com, or simply reply to this post. Please share this note as you see fit. Many thanks! Author stealingalltransmissionsPosted on April 27, 2014 Categories popular music historyTags CBGB, Clash, images, London Calling, Max's Kansas City, photos, Stealing all transmissions1 Comment on new version of Stealing — images wanted!